It has been way too long since we have posted a peanut butter and chocolate recipe here on Caramel Potatoes – shame on us, but this one is definitely worth the wait! 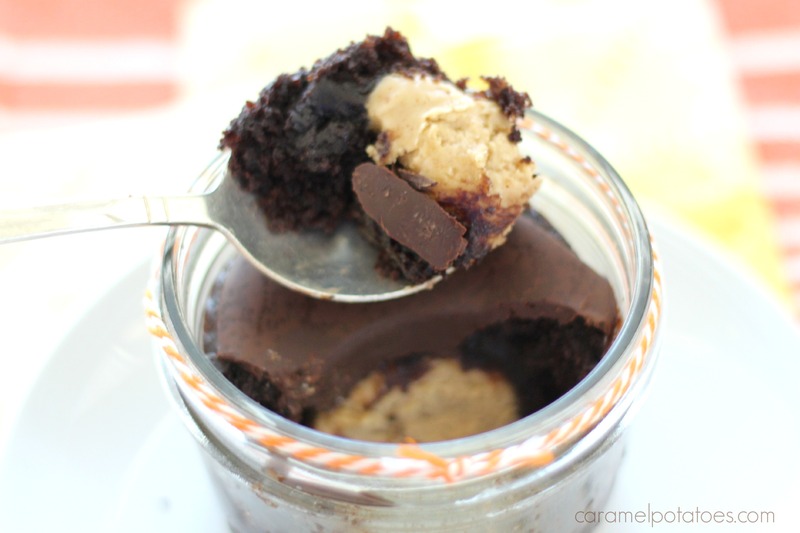 Not only do you get a great chocolate cupcake in a cute individual jar – but hidden in the center is a creamy peanut butter filling that tastes just like a Peanut Butter Cup! Don’t worry, it’s not difficult. The center is just a combination of peanut butter and powdered sugar rolled into a ball and plopped in the center of the cupcake before it bakes. 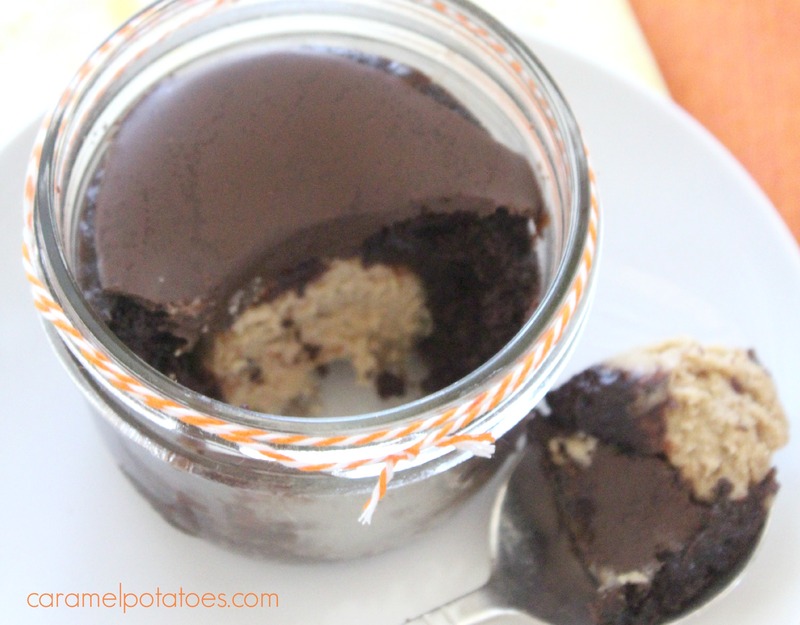 To complete the peanut butter cup taste – you’re going to add a sweet layer of chocolate to finish things off! 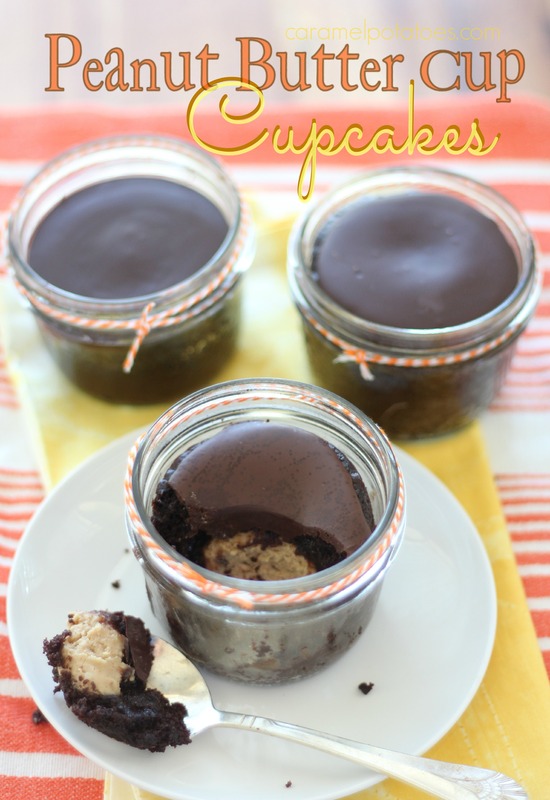 The individual jars make these adorable cakes perfect for parties, showers, or picnics. You can even put a lid on it and give it as a take-home gift! Time to start baking? Preheat oven to 350. Spray 12 (8 ounce) jars with cooking spray and set aside. To make the cupcakes: In a large bowl, sift together the sugar, flour, cocoa, baking powder, baking soda, and salt. In a separate bowl, beat together the eggs, oil, buttermilk, and vanilla. Mix the wet ingredients into the dry ingredients. Whisk in the hot water or coffee just until incorporated. Set aside. To make the Peanut Butter Filling: In a separate bowl, mix together the peanut butter and powdered sugar until smooth. Roll into 12 balls 1 1/2 to 2 inches in diameter. To assemble cupcakes: Scoop about 3 1/2 tablespoons of cupcake batter into the bottom of each of the prepared jars. Place a peanut butter ball in the center of each jar and cover with an additional 2-3 tablespoons of batter. Wipe away any batter from the outside of the jar or rim. Place the jars 2 inches apart on a large rimmed baking sheet. Bake for 18 to 20 minutes, or until the tops spring back when touched. Remove from the oven and cool for 10-15 minutes. To make Topping: Break the chocolate into pieces and melt in the microwave on 30 second intervals, stirring after each until melted. Spoon onto warm cakes and spread to edges. Allow the cakes to cool completely and serve at room temperature. I love the idea of just placing a lid on them and keeping in the refrigerator or freezer! Is the photo wide mouth 8 oz jars? They look like 4 oz regular mouth jars. Yes it is 8 ounce jars! Oh man these looks incredible! I’m trying to decide if I should be brave and try to make some for a large cookout we have coming up. Not sure I’ve got time to make 4 dozen! But I’m sure gonna give em a try in the near future! Can you freeze these? If so, how would you go about heating them up? Thanks. Sorry Katelyn I have never tried freezing them. I would try letting them thaw in the refrigerator overnight. Good Luck – let us know! Could these be shipped easily? Would they stay fresh for about a week? Hi Rachel – I have never mailed these, but the jars would definitely keep them safe. If I were mailing them I would opt for priority mail 2 day mail.